It seems like on Tuesdays my randomness hits an all-time high﻿. Soo today you are getting a whole slew of things going on in my head (lucky you). You all know my love/jealousy for the Tone It Up girls. I confess I do read the random newsletter emails they send me like we are true real life friends and they know who I am (you can sign up for them too on their website). It's somewhat true that I love to hate them too because their bodies are close to perfection and they have hair that I have always wanted, but can never achieve. BUT they recently just spilled their secrets & posted a Beachy Hair tutorial that I may or may not have ran home and practiced last night. I just can't seem to like this stuff as hard as I try. Anyone else have a hard time eating the organic kind? Ever since I cleaned out our refrigerator/pantry months back and made the switch to organic items, I've enjoyed all the organic foods much better..EXCEPT my dear friend peanut butter. Peanut butter is seriously one of my favorite things to eat (meaning I eat it by the spoonful out of the container) and I'm having a hard time adjusting to it..tear. Of course I went to the internet and read some advantages for eating the organic kinds, but I'm still not so sure I want to simply because it tastes NASTY to me. I've read that some organic peanut butters don't have added sugar, so the taste isn't as sweet. This is so true. Tell me..did you make the switch to organic Peanut Butter & is it worth it? I'm officially 80 years old. I now have a pill case. I have issues remembering to take my vitamins so this handy dandy contraption is now a part of my everyday life. Sad or just plain smart? Don't answer that. Lastly, I normally participate in Tail Wagging Tuesdays, but today I'm sharing this recent picture I took of Rocky, instead of a video, because I'm not so sure I will have time to take a video today. One time I accidently got organic salad dressing...the instant I took a bite I knew something wasn't right! I can't do organic! Thanks for sharing the video!!! I might have to try it too!!! lol!! I can't do the organic PB thing either. It's a tough switch. 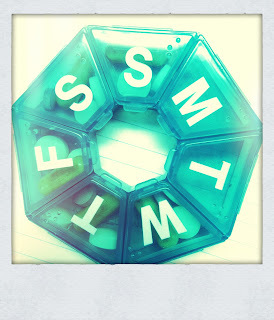 I blogged about using a pill case last week too! haha they are very handy and I never forget if I have taken my meds or not. LOL! I had the hardest time eating organic peanut butter when I first tried it. I almost had to train myself into liking it, which I guess I did do b/c I love it now! That dog melts my heart, too! Too stinkin' adorable! Thanks for linking up...I'm not sure what the deal is these days with linking up....I was pretty sure most people are tech savvy and would be able to share a video (with all the vlogs out there and what not!) a few have said they needed "time" to take a video...my b.....I tend to think of topics the night of! Loved the beachy hair video!! Thanks for posting it!! Ah i love the Tone It Up girls! They are amazing! Are you doing their bikini challenge and workouts?